He cackles again. It’s a strike for Mr Lagerfeld (as his numerous employees call him, or ‘Kaiser Karl’, as he’s known throughout the fashion world). Several strikes, in fact. In a couple of sentences, he has a) shown that he has superior taste to the original owners of the house we’re in – an elegant but, yes, rather conservative villa built in the late 1950s in the countryside near Versailles by the Finnish architect Alvar Aalto for the Parisian art dealer Louis Carré and his wife, Olga; b) dissed the French, who’ve never quite forgiven him for being German; c) wrought revenge on the intelligentsia for sneering at him for being in fashion; and d) spat out the word ‘bourgeois’ with a soap operatic sneer. Whether or not he approves of his surroundings, Mr Lagerfeld (as he’s in such a sunny mood, it seems mean to call him Kaiser Karl) has given up his Sunday to photograph La Maison Louis Carré for Wallpaper*. He’s doing it, as he does everything, accompanied by a SWAT team of black-clad assistants crying ‘Que c’est joli!’ whenever his images flash up on their iBooks. A luxury minibus has brought them to the house, while Lagerfeld and his driver did their bit for global warming by thundering along the autoroute in a Hummer. Every so often, one of the black-clad assistants approaches with a silver tray bearing a single glass of Pepsi Max. (Lagerfeld recently switched brands from Coke after a kerfuffle over calorie content.) His sole responsibility seems to be to ensure the boss can take a sip or two of fizzily fresh cola whenever he wishes. As for what he is wearing, it might not be what you would expect from a septuagenarian on a country jaunt, but it’s the uniform Lagerfeld has favoured ever since he shed 103 pounds a few years ago, and wrote about it in a best-selling diet book. Today it consists of: a skinny black jacket (Dior Homme); skinny black jeans (ditto); starched white shirt with a fine blue stripe and four-inch collar (Hilditch & Key); skinny black tie pinned with a pretty diamond and pearl brooch (Lydia Courteille); diamond-encrusted fobs (Chrome Hearts); an S&Mish pair of fingerless black leather gloves (Chanel); white powdered ponytail (his own). ‘Oh, don’t look at me today,’ he cries in mock horror, as though I could count on him to look completely different on another day. This particular guest editor of Wallpaper* needs little introduction, although for the benefit of readers who have recently returned from a Carthusian retreat, here’s a quick crammer. Karl Lagerfeld is a very, very famous fashion designer, who started off as an assistant to Pierre Balmain then worked for Jean Patou in the late 1950s, before designing for Fendi and Chloé. He clinched his place in fashion history by rescuing Chanel in the 1980s (one fashion editor had written it off as ‘Seconal City’), and thus triggering the ‘Lazarus’ syndrome of resurrecting deadbeat fashion brands. Cue Gucci’s revival by Tom Ford, Prada’s by Miuccia Prada, Lanvin’s by Alber Elbaz, Balenciaga’s by Nicolas Ghesquière and so on. Lagerfeld designs for Fendi and his own eponymous label, as well as Chanel, while flooding the fashion gossip mill with whoever happens to be in – his muse, Amanda Harlech, the stylist Charlotte Stockdale – or out – remember Hedi Slimane? – with him at any particular moment in time. 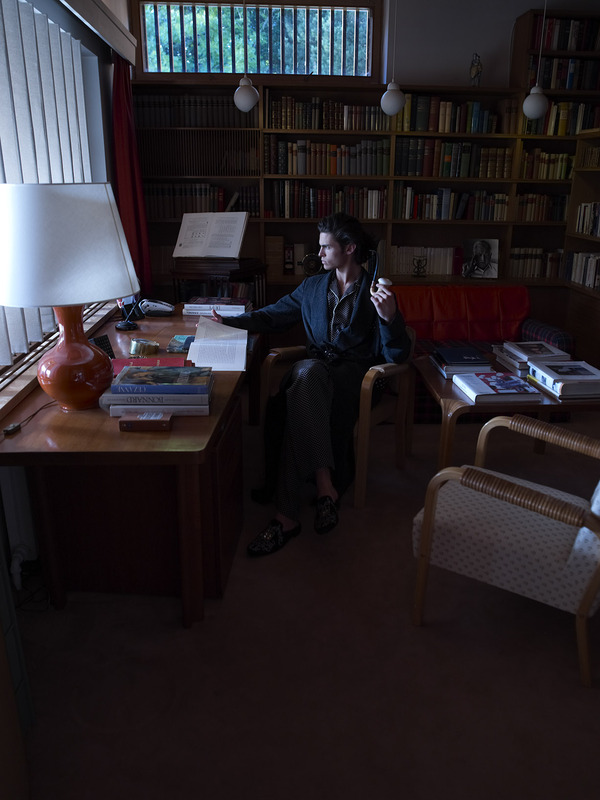 He somehow still manages to find time to ransack Colette’s music racks, buy thousands of books and read most of them in any of the four languages – German, French, English and Italian – he speaks fluently. And it shows. Lagerfeld can be thoughtful, funny, knowledgeable, bitchy and dogmatic all in the same sentence, and peppers his conversation with references to everything from Aristotelian rhetoric and German classical music to early 20th-century novels. Gilet; jumpsuit, both by Thom Browne. Shoes, by Number Nine. Each main room of the house leads to a private patio. Shirt; jeans, both model's own. Curtain Call She wears, tunic; collar; wrist cuff; basque; stockings, all as before. Her wears, brocate and lace bustier, by Chanel Hautre Couture autumn winter 1987. Trousers by Dior Homme. To Dine For Each main room of the house leads to a private patrio. Shirt; jeans, both model's own.